In 6-quart Dutch oven, cook bacon until lightly browned. Remove bacon; set aside. Reserve 1 tablespoon drippings in pan. Add beef; cook and stir until browned. Remove beef from Dutch oven. In same Dutch oven, heat wine to boiling. Add broth and 1 cup of the water; cook and stir 2 minutes. Stir in bacon, beef, mushrooms, garlic, thyme, salt, pepper and bay leaves. Over medium-low heat; cover and simmer about 1 hour, stirring occasionally, until beef is tender. Remove bay leaves. In small bowl, mix flour and remaining 1/4 cup water until smooth. Add to beef mixture; cook and stir about 1 minute or until sauce is slightly thickened. Cook fettuccine as directed on package. In 8-inch skillet, melt butter over medium-low heat. Stir in onions and sugar; cook about 15 minutes, stirring occasionally, until onions are lightly browned. Stir in onion mixture into beef mixture. Serve over fettuccine; if desired sprinkle with parsley. 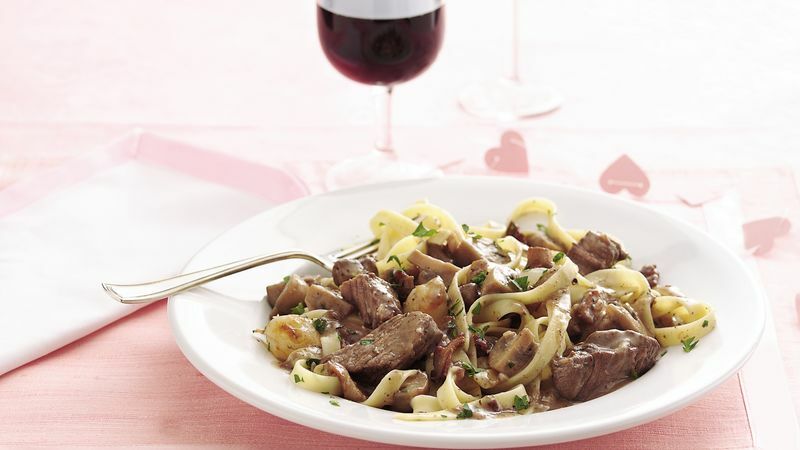 You can make the beef mixture ahead of time and just reheat it while the fettuccine is cooking.